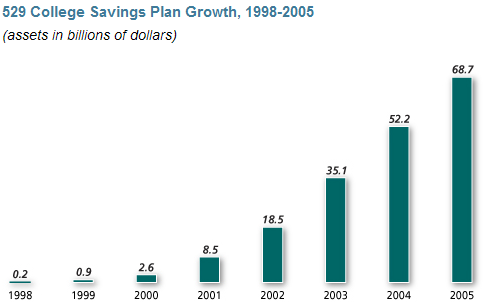 Early last week, Morningstar released its annual evaluation of 529 college savings plans. According to Morningstar, qualities of 529 plans continued to improve in the past couple of years as plan providers reduced fees (both Fidelity and Vanguard have lowered fees of their college savings products) and eliminated high-price offerings. Good news for parents who use 529 plans to fund their children’s future education also came from the Congress as the federal tax breaks for 529 plans, which were originally set to expire in 2010, have been made permanent by the Pension Protection Act of 2006. The change of the tax law removed one major hurdle which has been seen in the past as preventing the plan from becoming more popular. In fact, according to Investment Company Institute, the growth of 529 plans has picked up speed in recent years and the new tax law will only fuel the momentum. Among them the Colorado plan and Virgina plan are sold through financial advisors or brokers (therefore, the front-end load), while the other three are direct-sold plans. One of the main features of these plans is that they all have relatively low costs. and, as compared to the best plans, they all have higher fees and ERs. Also, as noted by Morningstar, these plans don’t offer an appealing line of products. * $20 maintenance fee is waived for Colorado and Wyoming residents and for more than $2,500 account balance. ** $25 maintenance fee is waived for direct payroll contributions, or a balance of $25,00o.